During my "Winter " vacation in California my GF managed to find the Orange Empire Railway Museum. They have a circuit of "Cape" (3'6") Gauge trolley (tram) track, together with a shed (aka Car Barn) full of stock. There is also a shed dedicated to 3 foot gauge stuff. Now this is a strange bit of kit, unfortunately a building, the sun (!) and a tree stopped me from getting any better photos of this beast..but it sure would make an unusual model. This gives a bit more information. That is a beast for sure. It was used for over 30 years too. The propulsion system is kind of scary for a construction machine. Thanks for the pics! So far this tiny pic is all I've found other than your pics. the whole thing looks very scary, unless a lot of equipment guards have been removed it would never pass any of todays safety regs. (I have seen big Electric face shovels & draglines at work.) At the moment though I cant think of an excuse to model it! More pics after the weekend of the 3 foot gauge stuff. Very interesting Trev, many thanks for posting. 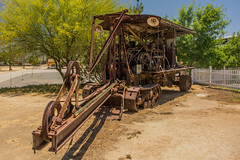 Machines like this where called "SKIMMERS"
They where also mounted on conventional track excavators. When I find the pictures I will post them. Thanks Chris! I think I know how they worked now. Your pics made it understandable. They would 'skim' surface stuff like pavement, lift the boom, swing and dump. Probably couldn't dig down hardly at all. Interesting machine.